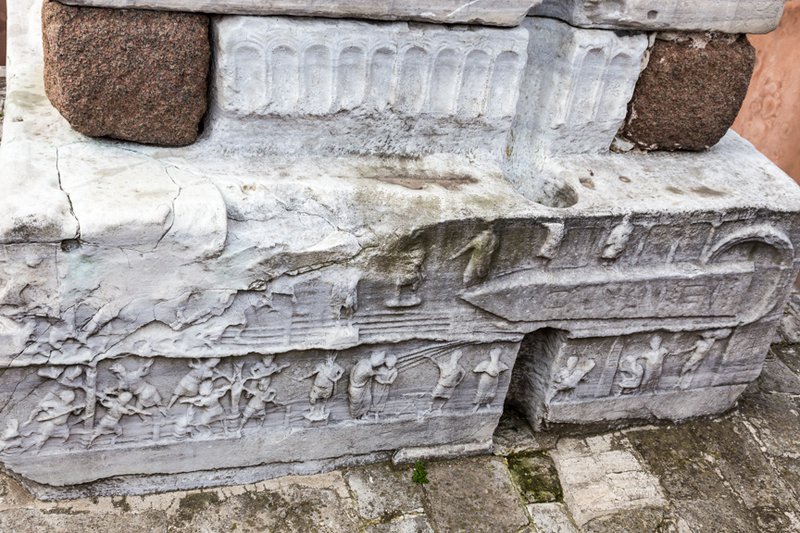 Istanbul, formerly Constantinople, was the hub of the civilized world for centuries, and the city’s treasures remain a powerful draw. On this day, we toured four of the major sites within the historic area with a private guide thanks to Turkey Tourism and Barefoot Plus Travel. Mehmet arrived at 9 and presented an informative orientation. We soon realized he has an incredible wealth of knowledge and felt lucky to be in his presence. Mehmet led the way as we climbed the hill to the Hippodrome of Constantine, the former chariot-racing grounds of the Romans and gathering place of the Ottomans. 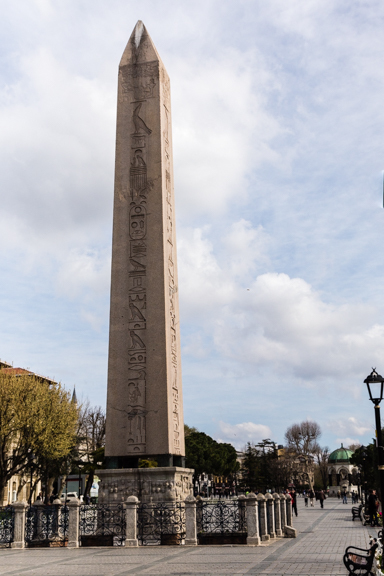 We stopped at the 400-ton Egyptian obelisk, originally carved with hieroglyphics around 1500 BC. We, and I suspect anyone without a guide, would miss reading the stone carvings below the monolith. They tell the story of how the massive column was raised into place using human power and ingenuity. Mehmet claimed it took 32 days. The base of the obelisk tells the story of how it was raised. Before entering the glorious Blue Mosque, officially named the Sultanahmet Mosque, we removed our shoes and covered our heads with scarves. The courtyard and fountains are reminiscent of the seductive Alhambra in Spain. We kept encountering dome after dome overhead as we passed from the courtyard into the sacred place. The mosque was constructed between 1606-1616 and the intricate curvilinear detail on the ceiling is like a fine embroidered silk. Multiple small domes and the main dome fill the vast interior held aloft by the hugest columns I’ve ever seen. A roped off section in the interior is still used by Muslims who come to pray. The plan was to build a mosque larger than neighboring Hagia Sophia, but Sultan Ahmet changed his mind and decided to scale down the size. However, visually the architecture and design of the exterior are much grander than its historic neighbor. 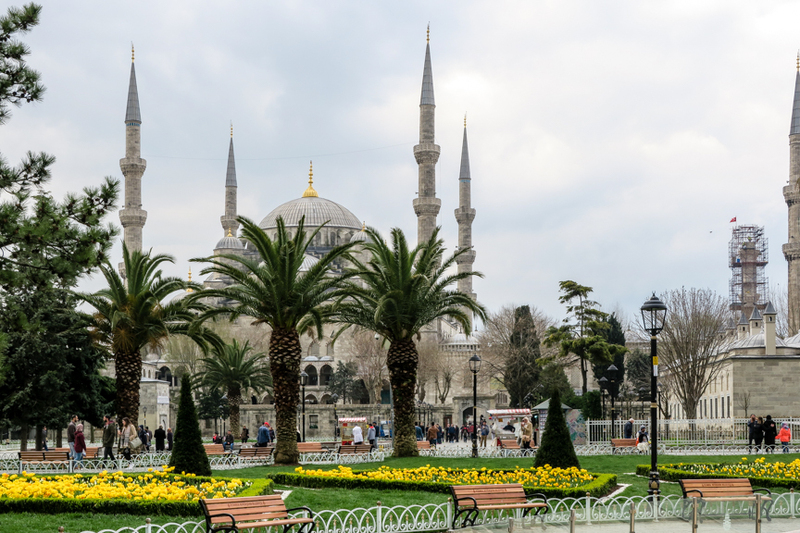 We left the Blue Mosque through a doorway that opens toward a wide plaza filling the space between these UNESCO World Heritage sites. The pedestrian-only park is filled with vibrant flowering gardens, fountains and walkways. Tulips are definitely in bloom. Looking back at the Blue Mosque. Hagia Sofia was originally built and used as an Orthodox Church for about 1,000 years. In 1453, it was converted to a mosque. Ataturk, Turkey’s first president, proclaimed it a museum in 1935. Therefore, visitors do not need to cover their heads, but must pass through a typical TSA-like screening. The center dome is the fourth largest in the world (following the Vatican, St. Paul’s in London, and Florence’s Duomo.) It is, of course, the oldest, completed in 532 AD. The dome’s diameter measures 107 feet and appears to hang in midair without support. There wasn’t another monument of this size constructed for another 1,000 years, an awe-inspiring reminder of the knowledge acquired by the Byzantines. Our guide showed us how one side is now off-center, but you would never know just looking at it. Despite the earthquakes that hit Istanbul from time to time, Hagia Sofia remains intact although it has undergone many restorations. Today, scaffolding covers one side of the interior. Looking at the dome in Hagia Sofia. We climbed to the second-floor galleries via a series of inclined rocky ramps. Here you can view the intricate golden mosaics from the church’s earliest period, those that were previously covered by plaster when the structure was converted into a mosque. However, the figure of the Madonna and child, just below the central dome always remained visible – only the eyes were concealed. Ancient mosaics in Hagia Sofia. Judy and I still had the Topkapi Palace to see, former home of the sultans. ( I suggest a visitor tour just these two shines and the Hippodrome in one day, leaving a full day for Topkapi.) We really didn’t have enough time to bask in their glory and appreciate their incredible history and significance. Topkapi was the official residence of the Sultans, a huge estate sitting on the top of a hill covering 72 acres. About 5,000 people lived there: 3,000 as workers and 2,000 as part of the royal household. You’ll find a number of buildings, not just one immense palace, scattered over the grounds. The Treasury rooms hold priceless jewels and decorative arts including the Topkapi Dagger and a fabulous Spoonmaker’s Diamond, an 86-carat gem. The kitchens include a rich collection of Chinese porcelain. 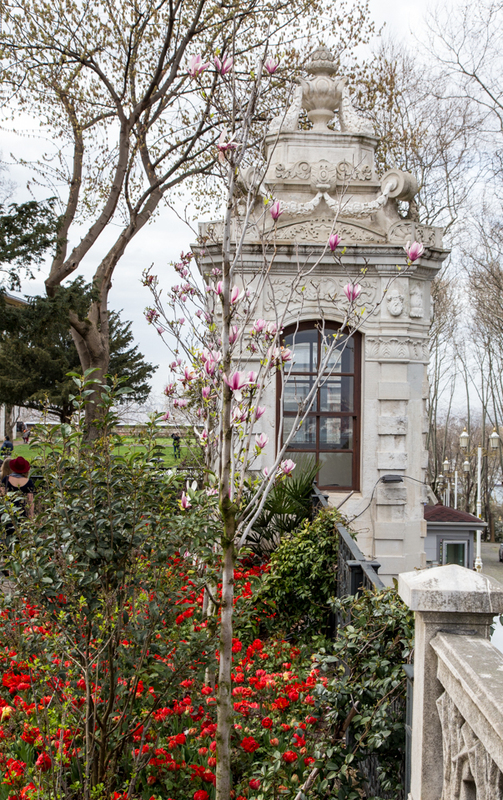 Gorgeous blooms on the Topkapi grounds. The gardens are gorgeous and alone are worth the price of admission. Most tourists see only about one-tenth of the estate and a rainstorm cut off portions of our tour. We did not visit the famous harems or sultans rooms, but would tour these at Dolmabahçe Palace, the last home of the sultans on another day. To fully cover Topkapi, allow at least a day. Turkish rugs are considered the finest and we stopped into Agora, a carpet merchant near the Grand Bazaar, and met Erdine Omac, the General Manager. We watched and learned as he explained how the double knot process is used to create rugs made from silk or wool. 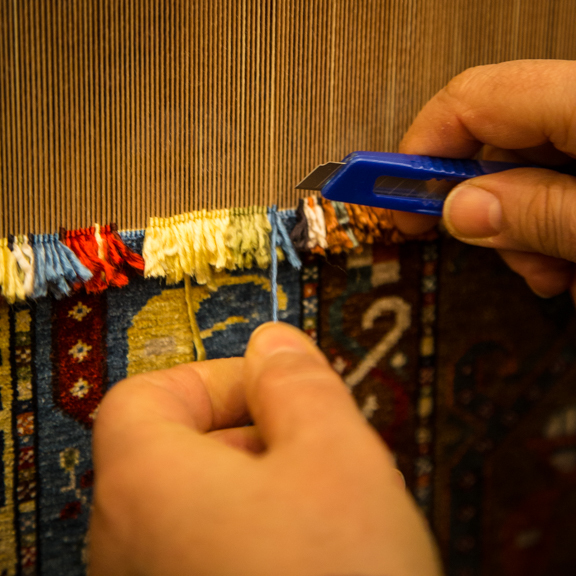 The best rug markers are artists with highly developed skills that can only work about 2-3 hours per day, taking breaks to give their eyes and hands a rest. 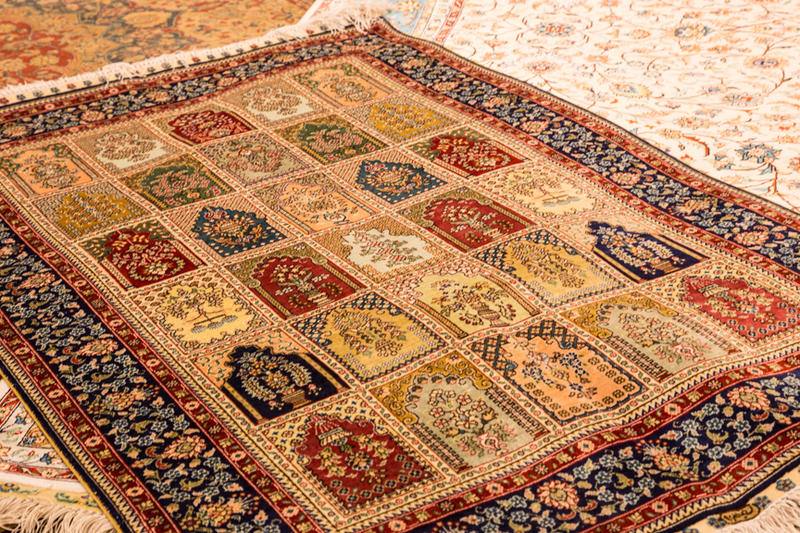 Erdine presented a history of rug development by having his assistants’ present rugs from various locations showing how they evolved into more complex designs. The introduction of mercerized cotton on the loom increased the number of threads and made more intricate designs possible. While the purchase of a large rug was out of our budget, we agreed that they are worthwhile investments that can be used and enjoyed. Judy surprised me by choosing to buy a small runner for her apartment. Shopping in the Grand Bazaar. Final stop was at a craftsman’s gallery in the Grand Bazaar. Nick Merdenyan hand paints designs and verses on dried Dieffenbachia leaves giving them new life. His artistic leaves are framed between glass and are often commissioned or given as gifts. Nick is a master calligrapher as well as a painter who studied Judaism, Christianity and Islam. His works incorporate a broad range of inspirational and religious themes. Interestingly enough, Nick gets his leaves from Florida, where he makes an annual visit. The day ended in a deluge of rain, and we arrived back to our room soaking wet, tired, but very thrilled with what we had seen and done on this day. What beautiful photos of Istanbul! They bring back great memories of my trip there last fall. I’ve never heard of paintings on Dieffenbachia leaves but they are quite beautiful and I’ll look for them ( and Nick) next time. What a treasure trove of art and architecture in one day! Beautiful! Too much for one day, but it was planned for me. Thanks. Nick’s work was incredible.